We expect to complete renovation of the Beinecke Rare Book & Manuscript Library by mid-summer 2016. To allow adequate time to move staff and collection materials back into the original building at 121 Wall Street, the Beinecke will close completely during the month of August 2016. Collections will not be accessible during this four-week period, for researchers or for class sessions. From now through July 2016, the Beinecke staff will continue to maintain a temporary reading room and classroom in Sterling Memorial Library to allow researchers to consult collections and to allow faculty and teaching fellows to use collections in class sessions. 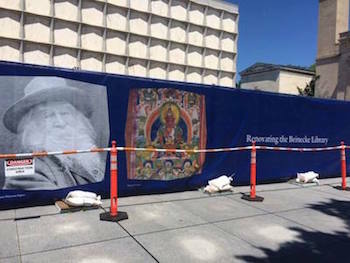 We ask for your patience and understanding as we make way for a beautifully renovated building and expanded and improved teaching spaces when the Beinecke reopens in September 2016.